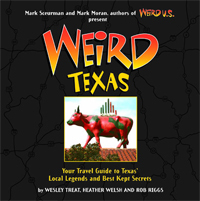 It stands unadvertised on the outskirts of a remotely north Texas city and yet remains the most familiar roadside attraction in the state. If it weren't for the Alamo, it just might be the most familiar attraction period. For more than 30 years, Cadillac Ranch has lured sightseers into a dusty Amarillo wheat field with the promise of offbeat nostalgia. Though it was dreamed up after the Mother Road fell into obsolescence, this work of art captures in perfect spirit the character of bygone Route 66 kitsch. It's Americana within Americana. Not only is it a perfect example of roadside waggery, but the work itself is a tribute to the unmistakably American tailfin. Trained on the vast Panhandle sky, 10 rear ends, built between 1949 and 1963, illustrate the rise and fall of a distinctive automotive style. Actually, they might each be a pampered collector's item if the whole lot weren't situated halfway in the ground––a sight many classic-car enthusiasts can bear seeing about as much as they can stand having to look up words like "waggery." 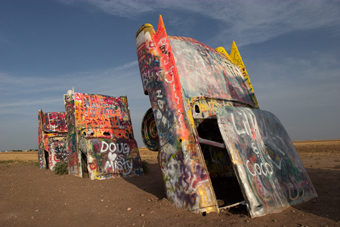 Most, however, look upon Cadillac Ranch with fondness. It's a Lone Star icon, embedded not only in the landscape, but in the hearts of many who make the trek out to see it. Some who first visited as children have brought their own kids out for a look. It's one of very few roadside attractions to maintain its allure across generations. Most who stop by leave a little something of themselves behind. Decades' worth of aerosol scrawl covers every inch of the monument. If you could leaf through the immeasurable strata of spray paint, you would see declarations of love, delirious observations, incomprehensible doodles, demented messages to the world, and countless names and initials. Certain layers mark significant moments like rings in a tree: a wash of white on a major anniversary, original colors for a historical restoration, a coat of black after the death of one of the work's creators. 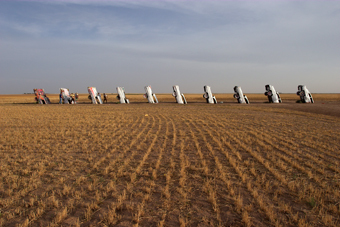 The appeal of Cadillac Ranch is hard to pin down, but its inimitable charm and its ability to capture within its own skin the memories of those for whom it remains standing have ensured it a place in Texas lore. Assuming the ever-thickening layers of Krylon stay ahead of the rust, it should continue to beguile and bewilder for generations to come.